For fighter info, see Robin (SSB4) and Robin (SSBU). For the Golden Sun character named Robin in Japanese, see Isaac. "Daraen" redirects here. For the smasher, see Smasher:Daraen. Official artwork of Robin from Fire Emblem Warriors. Robin (ルフレ, Reflet) is the default name for the avatar character in Fire Emblem Awakening. The idea of having an avatar for the player in the Fire Emblem series was previously explored in Fire Emblem: The Blazing Blade on the Game Boy Advance and Fire Emblem: New Mystery of the Emblem, Heroes of Light and Shadow on the Nintendo DS. These two games featured avatar characters named (by default) Mark and Kris, respectively. Mark, however, is not a playable unit, nor is he a pivotal character in the story; his appearance is often hidden, thus his customization is limited to gender, name, and birth month (blood type in the Japanese version). It was not until the creation of Kris when an avatar character could be used as a unit on the battlefield, and would be given prominence and personality in the story on par with its main character, Marth. Kris' customization is also greatly expanded from Mark's, giving the player more freedom for their appearance and playstyle. Fire Emblem Awakening reuses the idea of an avatar character through a customizable character named Robin by default, who is a main character alongside Chrom, similar to Kris and Marth before them. This idea was later used in Fire Emblem Fates, with Corrin. Before the story officially begins, the player is met with a Premonition, which briefly highlights the events of an alternate timeline. In the beginning of the game, Robin is found lying in an open field by Chrom, his sister Lissa, and his bodyguard Frederick. They find out that Robin is an amnesiac who remembers nothing besides their name, Chrom's name and his incredible knowledge and experience in fighting battles, which Chrom experiences firsthand after they manage to save a small settlement from a larger group of brigands. Frederick suspects Robin of being a spy due to remembering Chrom's name before their own, but Chrom is convinced of Robin's good intentions and invites them to join the Shepherds as their chief tactician, with the two quickly becoming close friends. Ylisse, Chrom's home country, is then faced with a war against Plegia (which is later revealed to be Robin's home country) and another against Valm two years later, both in which Robin's tactical expertise proves very helpful, especially given Ylisse's limited number of soldiers. There is also the constant threat of the Risen, undead soldiers who terrorize parts of the continent of Ylisse. As the Shepherds continue to fight and recruit more capable members, Lucina, Chrom's daughter from the future, properly introduces herself to them, having only met them while she was disguising herself as Marth. She, alongside the children of other members of the Shepherds, travelled back in time to warn them about the revival of the Fell Dragon Grima after having her own world on the brink of destruction courtesy of him. Robin, Chrom, Lucina, and the rest of the Shepherds make it their new mission to prevent the Grima of the current timeline from surfacing. In game, Robin starts in the Tactician class. This class is exclusive to Robin, their children, and DLC characters, and enables them to attack with magic tomes as well as swords. As the avatar character, Robin and their children can switch to any starting class the player desires using a Second Seal (aside from Lord, which is exclusive to Chrom and Lucina), making for one of the biggest skill pools possible for a single character. Robin can also support with every other character (as could Kris previously), and marry any opposite gendered character the player wants, including the future children of other Shepherds that are met via Paralogues (side stories) as more characters within the Shepherds marry each other. Robin's customization focuses more on appearance and even features several options for voice. 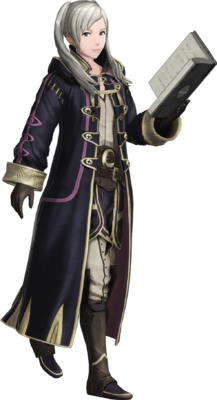 Since Awakening, Robin has also appeared as a guest character in Code Name: S.T.E.A.M., Fire Emblem Fates, and Fire Emblem Echoes: Shadows of Valentia, in each case summoned in-game using his amiibo. Appropriately, these games and amiibos also use the same "default" version of the male avatar depicted in Smash. The crossover games Fire Emblem Heroes and Fire Emblem Warriors feature both the default male and female versions of Robin as playable units. Both versions of Robin in Super Smash Bros. 4. Robin appears as a newcomer in Super Smash Bros. 4. Players can choose either the male or female models of the character, based on the default appearances for both genders in the Tactician class. They use tomes of various elements (Fire, Thunder, Wind, and Darkness) along with a Levin Sword. Their tomes and Levin Sword have a limited amount of uses before they break, reminiscent of the durability system in the Fire Emblem series; they will recharge after a certain amount of time has passed. If the Levin Sword breaks, they use an unbreakable Bronze Sword instead. On the current tier list, Robin places 37th out of 55, at the bottom of D tier (tied with Samus). The various tomes at Robin's disposal allow for a strong zoning game, which also grant versatility for use in many different situations. The Levin Sword is also quite powerful, possessing generally high knockback, especially with up aerial. Although the durability system implemented into the tomes and Levin Sword temporarily disable some of Robin's attacks, the sword and tomes themselves can be picked up before they disappear and used as strong projectiles. However, Robin's main weakness is poor mobility, having the slowest running speed out of all fighters. They also have mediocre defensive games, which combined with their poor speed, can leave them open to assaults at close range, especially by fast characters. Overall, Robin has garnered some notable players, though average tournament results. 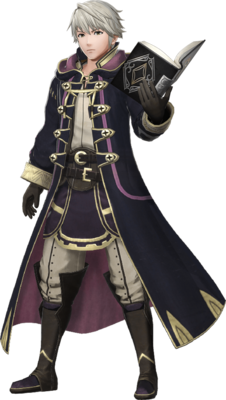 This is the male Robin, your avatar in Fire Emblem Awakening. The goal of this adventure doesn't change much because of your gender choice, but Robin's marriage options do. In Smash Bros., Robin brings powerful magic and swordplay to bear. He can exhaust his moves, but they'll be restored over time. This is the male Robin, an avatar in Fire Emblem Awakening. The goal of that game doesn't change much because of your gender choice, but Robin's hairstyle options do. In Smash Bros., Robin brings powerful magic and swordplay to bear. He can exhaust his moves, but they'll be restored over time. When Robin is found at the start of Fire Emblem Awakening, he (or she!) discovers that, even without his memories, he is a master tactician. In this game, his attacks are powerful, but in true Fire Emblem style, how many times his magic can be used is limited. This also applies to the thunder magic his sword is imbued with. Robin's magic is powerful, but it has limited uses before needing to recharge. Thunder can be charged in stages, will become Thoron at max charge, and gains damage and speed with its charge. Arcfire creates a flame pillar, perfect for dealing with an edge-clinging foe. Robin's magic is powerful, but in return, its uses are limited. You can charge Thunder in steps, and when it's fully charged, it turns into Thoron, increasing its speed and dealing more damage. Arcfire creates a flame pillar when it hits something. Use it on an opponent who's clinging to an edge to stop them getting back on the stage. Male Robin as he appears in Super Smash Bros. Ultimate. Both the male and female Robins return as playable characters in Super Smash Bros. Ultimate. Unlike Smash 4, Robin is an unlockable character rather than a starter character. Portrait of default male Robin, as he appears in Fire Emblem Awakening. Default female Robin, as she appears in Fire Emblem Awakening. Female Robin as she appears in Super Smash Bros. Ultimate. Robin, Lucina, and Chrom are the only playable Fire Emblem characters in the Super Smash Bros. series debuting in the same Fire Emblem game. Robin is one of two Fire Emblem characters to utilize a weapon other than a sword. 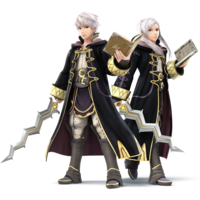 Robin uses their tomes, and Corrin can transform into a dragon for many of their moves. In "Fire Emblem Awakening", Robin is not able to use Nosferatu in their default class. Robin can only use it by changing their class from a Tactician into a Dark Mage or Sorcerer. 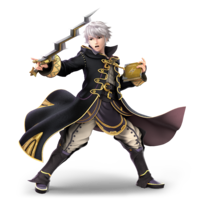 Robin can still use the Levin Sword and the other tomes that appear in Smash Bros as a Tactician. Robin is the only Fire Emblem character to not use Counter. Instead, they utilize Nosferatu. As with Pokémon Trainer, Corrin and the Inklings, the male and female variants of Robin have been established as separate entities, since one gender can encounter the other as an enemy in "Fire Emblem Heroes" and "Fire Emblem Warriors". This page was last edited on March 29, 2019, at 03:01.